Indian Overseas Bank as corporate agent under IRDAI does not underwrite the risk or act as insurer. 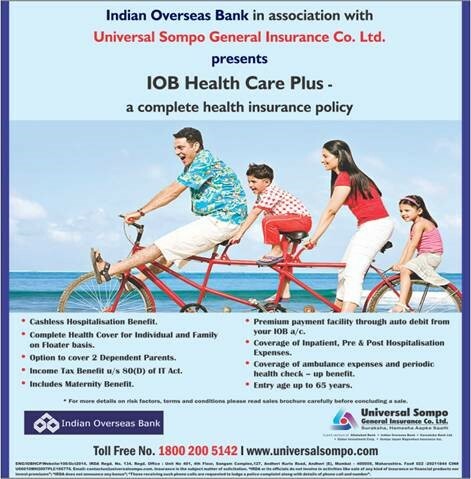 IOB Health Care Plus a unique health/ mediclaim cover offered by Universal Sompo General Insurance in association with Indian Overseas Bank. The IOB Health Care Plus is a complete health Insurance Plan that covers Proposer, spouse, two dependent children, dependant parents and unlike any other regular policy, wherein a family has to take individual policies for each member, this unique family floater gives you the flexibility of taking one policy that covers the entire family under a single sum insured. c. Any surgery that is required in respect of any disease. The policy provides for Mediclaim Insurance cover, which is available to all the customers of IOB maintaining a S.B. or C.D account with them including NRI customers. However, the cover is available for treatment in hospitals, in India only. How can one become a member? The procedure to become a member of the scheme is very simple. There is no medical examination. All that the account holder requires to do is fill up and sign a proposal form which includes declaration of good health. How the premium is to be paid? The premium will be debited to the S.B. or C.D. account as per the authorization given in the proposal form. What is the period for which the insurance is available and how it is renewed? The insurance cover is available for a period of one year from the date of debit of the premium. Renewals are to be done on yearly basis on or before the due date. What are the documents given in proof of insurance? The account holder will be issued with a copy of the proposal form duly acknowledged by the branch for having debited the premium amount to the account. After receipt of the proposal form by the Insurance company and (in house TPA), a policy will be issued by Insurance company and ID card will be issued by (in house TPA). All account holders of Indian Overseas Bank within the age band of 18 to 65 years are eligible to take the Policy. An individual may cover himself/ herself and his/ her spouse, dependent children under Plan A of the Policy and himself/herself, his/her spouse, dependent children and dependent parents under Plan B of the policy. Wide Range of Sum Insured - Options ranging from Rs 0.5 Lac to Rs 5 Lakhs are available. Enrollment age under the policy is between 5 years and 65 years. Dependent children from age 3 months can be covered with at least one parent under the Policy. Maximum age under, till which dependent male child can be covered is 21 years and Female up to 25 years or till their marriage whichever is earlier. D. Anesthetist, Blood, Oxygen, Operation Theatre charges, Surgical appliances, Medicines & Drugs, Diagnostic Material and X-ray, Dialysis, Chemotherapy, Radiotherapy, Cost of Pacemaker, Artificial Limbs. Expenses on hospitalization incurred anywhere in India are covered. Expenses on hospitalization in Bhutan and Nepal are also covered but Cashless service is not available. Claim settlement will be only in Indian Currency. Expenses on hospitalization for a minimum period of 24 hours are admissible. However, this time limit is not applied to specific treatments, i.e. Dialysis, Chemotherapy, Radiotherapy, Eye Surgery, Lithotripsy (Kidney stone removal), D&C, Tonsillectomy taken in the Hospital / Nursing Home and where in the insured is discharged on the same day, such treatment will be considered to have been taken under hospitalization benefit. This condition will also not apply in case of stay in Hospital for less than 24 hours provided (a) the treatment is such that it necessitates hospitalization and the procedure involves specialized infrastructural facilities available in hospitals (b) due to technological advances hospitalization is required for less than 24 hours only. 1. Choice of Sum Insured ranges from Rs 50,000 to Rs 5,00,000 in multiples of Rs 50,000. 2. Enlisted Day Care procedure (procedures covered without 24 hrs hospitalization) covered. 6. Pre Hospitalization & Post Hospitalization- Covered for 30 & 60 days, before & after hospitalization respectively subject to availability of Sum Insured. 7. Hospital Cash to Parents- In case of Hospitalization of Children up to Age 12 years Cash allowance of Rs.100/- per day subject to a maximum of Rs.1000/- will be given to account holder. 8. Cost of Health check up- The insured shall be entitled for reimbursement of cost of 1% of the amount of average Sum Insured for health check-up once at the end of block of every Three Policy years (under this scheme) provided there are no claims reported during the block. 9. Funeral Expenses-In case of death of any of the insured persons following hospitalization with valid claim under the Policy, Funeral expenses of Rs.1000/- will be paid under the Policy. 11. Portability Benefit available-We can cover portability of benefits to similar cover under indemnity plan subject to intimation of complete details by application atleast 45 days prior to the expiry of existing policy. 12. Tax benefit: Only the Medical Premium Component (excluding Service Tax thereon) is eligible for rebate under Section 80D of the Income Tax Act. 1. You will be allowed a period of at least 15 days from the date of receipt of the Policy to review the terms and conditions of the Policy and to return the same if not acceptable. Hospitalization expenses incurred in first 30 days from the date of commencement of the cover will not be covered except in the case of death due to accident. Domiciliary hospitalization is not covered under the policy. Dental treatments except warranted due to accident and taken as inpatient. Injury or diseases directly or indirectly caused by or arising from or attributable to war, invasion, act of foreign enemy. Any expense on treatment related to HIV, AIDS and all related medical conditions. Other standard exclusions applicable to mediclaim policy will also apply. How to make a claim in case of hospitalization? Cash less treatment can be availed at network hospitals by showing the ID card issued by TPA along with the necessary photo ID proof as prescribed by the Insurance company and copies of valid insurance policies and in case for any reason cashless service could not be availed, the insured can meet the hospital expenses and claim reimbursement from Universal Sompo General Insurance Company Limited (USGI). You shall give USGI a notice to Our call centre immediately and also intimate in writing to Our Policy issuing office but not later than 7 days from the date of Hospitalization. A written statement of the claim will be required and a Claim Form will be completed and the claim must be filed within 30 days from the date of discharge from the Hospital or completion of treatment. You must give all original or copies of bills, receipts, certificates, post-mortem report in the event of death, information and evidences from the attending Medical Practitioner / Hospital / Chemist / Laboratory as required by USGI. On receipt of intimation from You regarding a claim under the Policy, We are entitled to carry out examination and obtain information on any alleged Injury or Disease requiring Hospitalization if and when We may reasonably require. Hospital as long as We are given notice that the Insured Person wishes to avail Cashless Service accompanied by full particulars at least 48 hours before any planned treatment or Hospitalization or within 24 hours after the treatment or Hospitalization in the case of an emergency (namely a sudden, urgent, unexpected occurrence or event, bodily alteration or occasion requiring immediate medical attention). In case if You want to avail cashless facility in any of the network hospital you shall follow the process as mentioned below. Carry the Health Card/ copy of E-cards. Obtain Pre Authorization form from the hospital counter. Fill up the form and submit it at the hospital counter. Ensure that hospital faxes the pre authorization form to TPA or you can fax the form to TPA yourself. Once the form has been faxed, TPA will send the authorization to the Hospital. Cashless facilities at over 4000+ quality hospitals across India. Processing Prompt settlement of both Cashless and Reimbursement claim by In House TPA. All premium rates are annual rates in Rs. Please note: This prospectus contains only an indication of cover offered, for complete details on terms, conditions, coverages and exclusions please get in touch with us and read policy wordings carefully before concluding a sale. Insurance is a subject matter of solicitation.